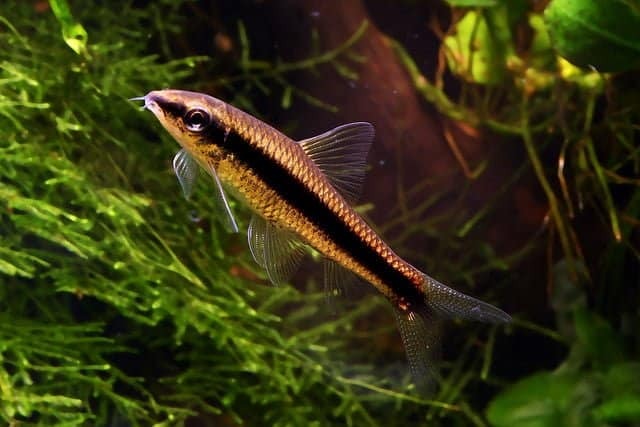 Siamese Algae Eater (Crossocheilussiamensis) fish is a peaceful one by its temperament. Not a very large one in size, it is known by its unique attribute – as a real tank cleaner! This fish is called SAE for short which is an abbreviation of its full name. 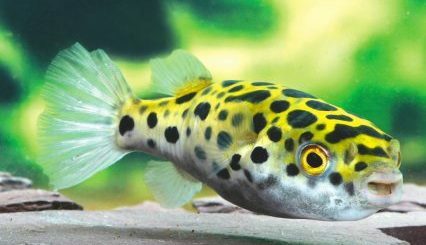 It eats algae in the water tank, as the name suggests, and the task is quite challenging as most of the fish cannot do it. This fish is quite often mistaken for another one called Epalzeorhynchuskalopterus or commonly known as the ‘Flying Fox’ since they both look quite alike and are fond of eating algae; however the latter is more aggressive as compared to Siamese Algae Eater. The Siamese Algae Eaters are quite famous at pet stores and are also quite cheap to buy! The main distinguishing feature of Siamese Algae Eater is their black stripe on its body. It starts from the mouth of the fish, and it ends towards its tail fin. On its upper side, the fish has a brown tint with each scale having dark edges. 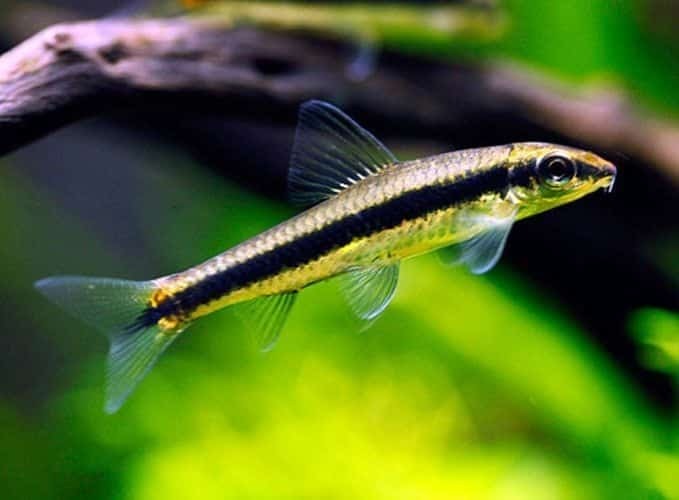 Moreover, the Siamese Algae Eater has a pair of thin forward barbells which may rest on the cheeks of the fish when it relaxes or swims. 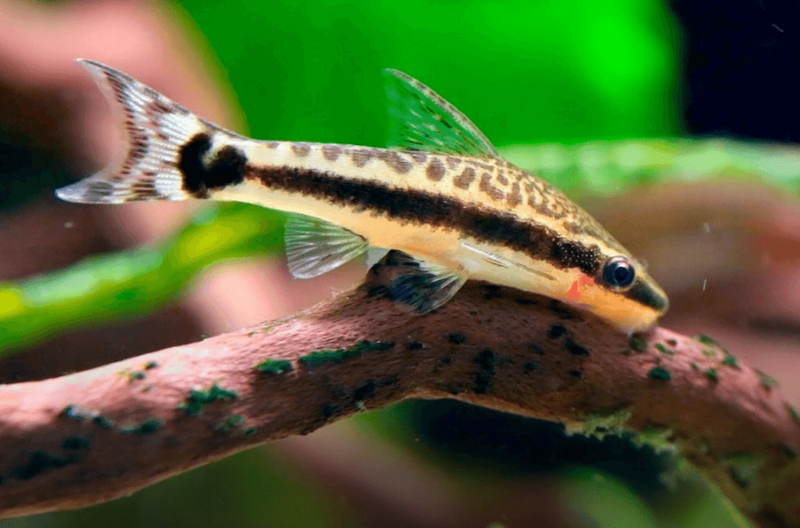 The Siamese Algae Eater has three support points when it is lying on the bottom of the tank. It is the tail and the ventral fins at that the fish does not touch the substrate of the tank with its pectoral fins. These fish do not have a swim bladder as such they must be in constant motion or else it will sink. 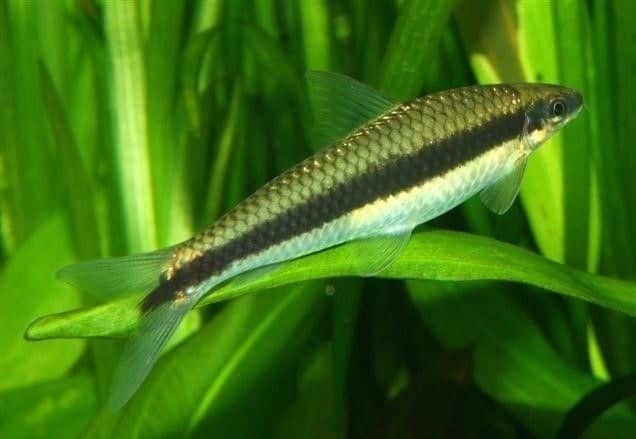 It was thought earlier that the Siamese Algae Eater belonged to the genus “Epalzeorhynchus” as per a scientific classification. With the latest research, we now know that it belongs to the Crossocheilus family. Malayan and Thailand peninsula is known to the natural habitats for the Siamese Algae Eaters. 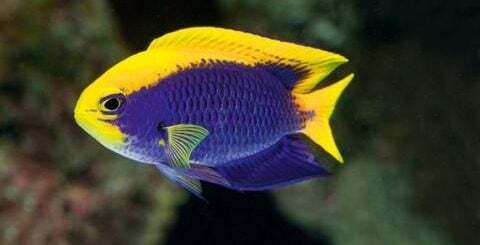 This fish is known to be the only one that can eat coarse algae and is known to be of great help for the home tanks where people have to deal with BBA (black beard algae) in their tanks. 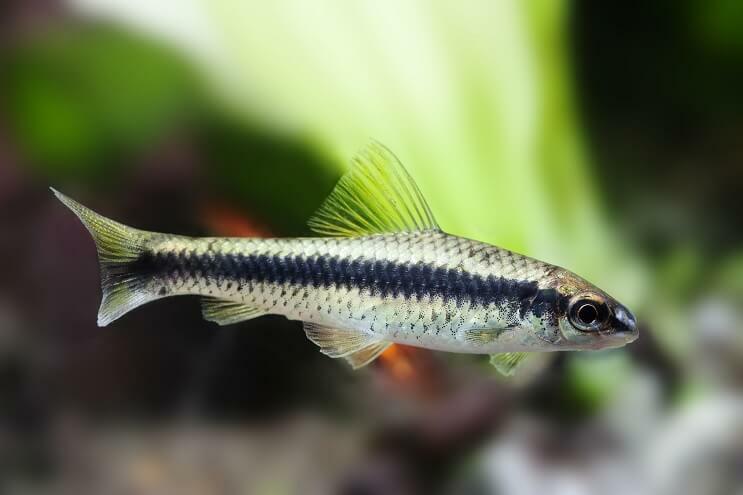 These fish are usually found in fast-moving rivers and streams with rocky bottoms and consists of gravel, field stones and sand with a large number of tree roots and snags. Having a low level of water with transparency provides favourable conditions for the growth of blusterous algae, and the fish feeds on them. The central part of what they feed on is in their name. They have become famous for eating algae, but they are not limited to that. 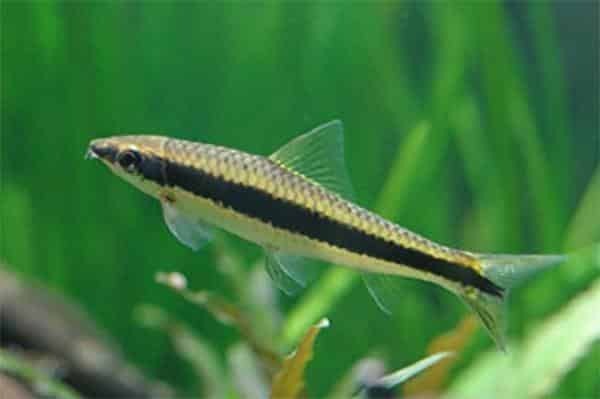 If you have an algae problem in your tank, these fish would be a great help, but you would need to fix the problem anyway as the Siamese Algae Eater fish are not the cure for all algae. They are not fond of the green spot and blue-green algae. While they are in the wild, they eat plant matter and vegetation apart from algae. They also feed on periphyton and phytoplankton. They are not just herbivores, however; in fact, they are scavengers and will feed on whatever they can easily find, which includes dead fish and insects. While they are in the tank, they will eat all types of living, frozen and even dry specialized food. They are generally not fussy eaters and will eat most of what you will put in their tanks which includes flake and pellet foods from stores as well as algae wafers. Other examples of what they prefer to eat are bloodworms, brine shrimps, etc. Sinking foods like pellets are good for the bottom-dwelling fish as it falls past the fish which are higher up in the aquarium. They should, however, have a diversified diet which should include a large amount of plant food. If there are not enough plant components in the fish diet, then they might start eating the tank plants, especially certain types of moss. 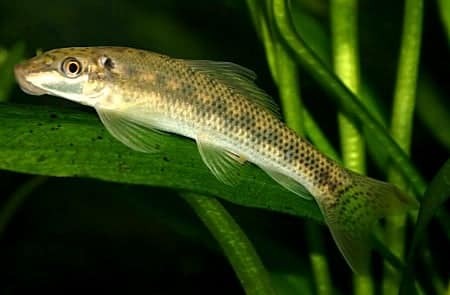 The juvenile of the Siamese Algae Eater generally eats the most algae while the adults prefer to have a protein-based diet. Overfeeding the fish can be a problem as they already have access to plants and algae in the tank, before their feeding time. These fish may stop eating the algae in favour of the other foods if you give them too much. These fish generally eat a lot and will continue eating as long as you will keep on feeding them. This is why you should limit their feeding to a certain amount which they can finish in a few minutes. There are generally not any specific diseases that they are prone to, but that does not mean they will not get any diseases at all. Most of the diseases which they can catch have certain signs and symptoms which can become apparent. For example, Ichthyophthiriusmultifiliis is a common parasite disease which is popularly known as ‘ich’. This causes white, small dots all over the body. Most of the diseases have medicines and treatment that can be bought and works well with the quarantined tanks. The best way, however, is to prevent the fish from getting a disease in the first place. Giving the fish high quality of food is less likely to cause organ problems, while cheaper foods can cause constipation. 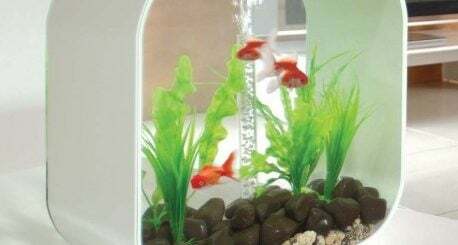 Having dirty water in the tank is similar to breathing polluted air, as such water should be changed every two weeks at least so that there is no buildup of any pollutants. Lastly, you must also be careful of what you add to the tank as decorations have toxins. Water from other tanks can also bring diseases. The Siamese Algae Eaters breed in the same way as other fish do, but it is unlikely that you will be able to breed these fish yourself. They are generally known to breed in the farms with the help of hormones, and there is no reliable information available to suggest that they can be bred successfully in the home tank. Even the process of sexing them requires a keen eye and is quite hard. The females are 30% larger in their size once they are matured fully. The process of spawning can be triggered by the changes in the condition of the water, such as the pH levels or the temperature of the water. Currently, it is unknown as to how to breed this fish in the home tanks. These fish spend most of their time at the bottom of the water tank. As such, it should be a sandy substrate which makes it safe for them to swim around without damaging their sensitive barbells or scratching their bodies. There should be plants added to the tank so that they feel comfortable and at home. The plants act as a shelter for them, and the water should be kept clean and well oxygenated. There is a possibility that they can start eating on the plants in the tank if they are unable to find food. As such, keeping them well fed is one way of protecting the plants in your tank. Another tactic is to use the fast-growing species such as the hornwort which can recover quickly if the plants are eaten by them. All fish, especially the bottom dwelling ones, like to have placed in the tank where they can hide away from the other tank mates. You should, therefore, create caves for them in the tank to provide them away for an escape. They are generally not territorial, so there would not be any dispute over who goes where. Moreover, these fish are quite quick and active which can make it easy for them to jump out of the water, so keeping a lid on the tank will ensure that they do not make a fatal escape attempt. A heater would be required to maintain the temperature in the range of 75-79°F while the hardness of water should be kept at 5-20 dH. There are no particular requirements for the water flow which may be a surprise as they dwell in the rivers. These are good tempered fish and can be friendly tank mates for even the most aggressive types of fish. It is however advisable not to keep them with the long-finned ones, since the Siamese Algae Eaters may nip their fins. The Rainbow Shark is a species with whom they should not be placed with since both of the species are related and territory dependent ones. They generally do not get along an end up fighting with one another. 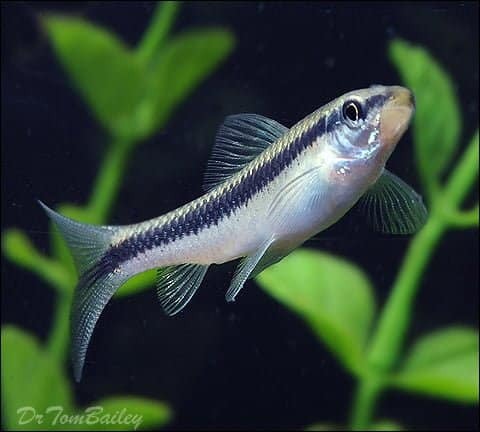 A lot of male Siamese Algae Eater fish should also not be kept in a small tank. Moreover, since these are very active, they should not be placed with the cichlids since they are very territorial during their spawning period and the SAE will disturb them by swimming around.